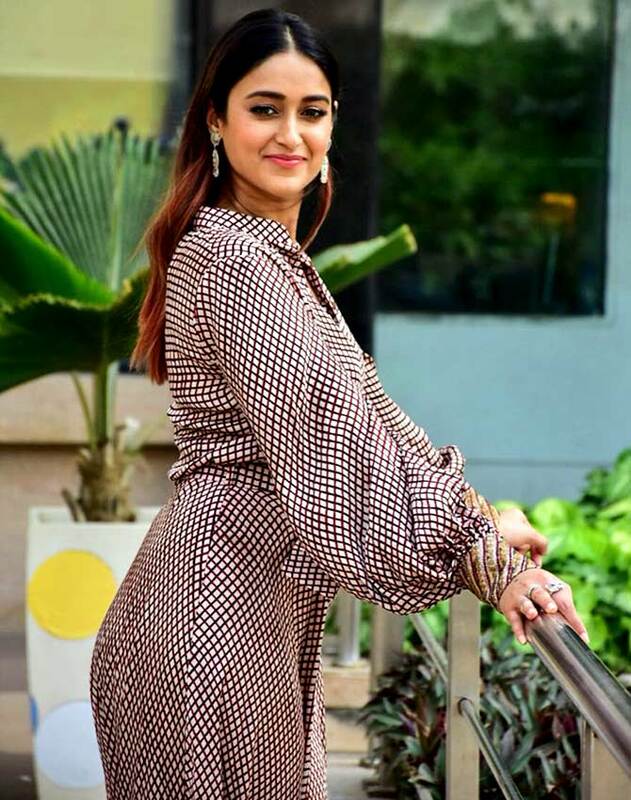 "I was like the Akshay Kumar of the south," Ileana D'Cruz states, as she settles down for an interview with the media to promote her movie, Raid. Ileana makes the comparison because she had a very busy career down South before she made her Bollywood debut with Barfi! in 2012. Six years, and eight films later, Ileana is happy with the kind of films she's doing in Mumbai. These films, she says, have helped her become a smart, sensitive and mature person. Ileana discusses Raid, her equation with Ajay Devgn and reveals the harassment she faced from a Bollywood 'superstar'. Rediff.com's Patcy N takes notes. What was your reaction when you first heard the script of Raid? Ajay told me it was a very interesting role for a girl, but not a long one. He asked me to hear the script and see what I thought. I did not know what to expect, but I knew that Raj (Kumar Gupta) was the director. I think he is a great director, so I was quite interested. I got goose bumps after I heard the story because you don't realise the details that goes into a raid. Nowadays, we read about raids in newspapers and hear the victim's side of it, the person who has been raided. You don't hear about the inspector (the income tax officers). The person on whom the story is based is unbelievably brave. I can't imagine what kind of guts it takes to do that. I have tremendous respect for him as well as the I-T officers. Do you still look at the length of the role? Obviously not, (since) I have done this film. If you are visible in the whole film, but there is no depth in your role, then the role is not significant. But it makes a difference when you have a two minute impactful and intense role. My character is very brave and smart. In the 1980s (the period when Raid is based), the movies had women taking care of the house and cooking. That's very different from the character I play. She's very forward thinking. Women have changed a lot since the 1980s. Today's women are more outspoken. They don't think much before they speak. 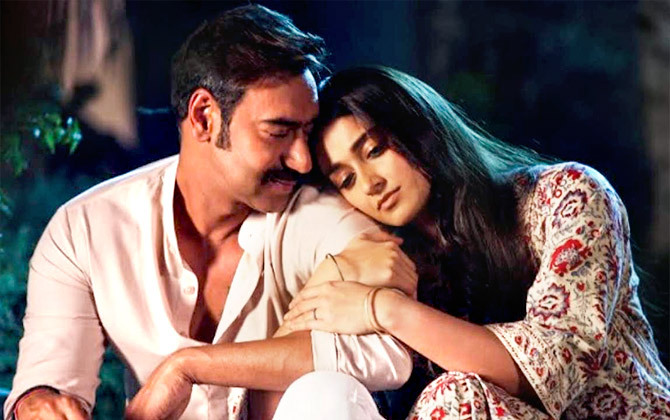 IMAGE: Ileana and Ajay Devgn in Badshaho. Isn't this character like the one you had in Rustom? In Rustom, my character was vulnerable and sensitive. But this one named Malini is smart and brave. Normally, income tax officers cannot tell their wives about the raids they conduct, they don't share case details. So their wives have to be brave and that comes across through a dialogue in the film. Your onscreen chemistry with Ajay Devgn is quite good. Yes, that is what people are telling me. Honestly, I have no idea. We haven't discussed anything. From day one of working with Ajay, he has been like a friend to me. I am comfortable working with him. The first day I went on the sets of Badshaho was also the last day of the shoot. I was very nervous. I had a lot of lines and was worried how I would finish in a day. I was panicking, so Ajay made me relax by saying that if it did not happen in one day, they would continue shooting it the next day. I like the fact that he's very easygoing. There's a mutual respect for each other. He's very easy to talk to. IMAGE: Nargis Fakhri, Varun Dhawan and Ileana in Main Tera Hero. You have done roles that are glamorous, intense and with grey shades. How do you see your career growth? With every film, you grow a little. Acting is a career where you keep learning with every film you do. All my film choices have helped me evolve, become stronger and mature. Do you think actors get more options than actresses do? At the end of the day, it is on the actress, whether she chooses to do unimportant roles or not. If actresses turn down roles they are not happy with, change will inevitably happen. A lot of mainstream actresses are taking a stand and are not playing such roles any more. That's why I suppose there is change. I can't speak for others, I can only speak for myself. I am done playing the bubbly, cute, girl. I am sick of it. It's fine doing it once in a while. I feel we are hungrier for different roles, meatier roles. In fact, I was in talks for a heroine-centric role. The funny thing is that I was sitting with the director deciding which actor should be cast for it. So it was actually the other way around. What are the difficulties involved in refusing roles? Is there a fear that the director may not approach you again? The fear is really whether I'm making the right decision or not. What if that film becomes a humongous hit and I just missed out something really good? At the end of the day, I must realise that if I am refusing a film, I have to make peace with it and move on. I have refused quite a few films that have done very well, but most of them haven't. So I've been right the majority of times. Every film teaches you something. What have you learnt from films like Barfi! or Main Tera Hero? I had done so many films in the south before I did Barfi!, but I feel Barfi! wiped that slate clean. For the first time, I felt like an actor because everything that I did after that was something I had never done before. I was so used to showing emotions that being so subtle for a change was different. I was not sure whether it was considered acting at all. It was a different form of acting for me. It taught me about relationships. I hardly remember the conversations I had with Dada (Anurag Basu, director), as I had so many. I was watching the making of the film video and he was saying that he had to sit with me, and explain about divorce, relationships and marriage and how it works. With every film, I have learnt something. But some films taught me how to be stronger because sometimes, you are dealing with people who are very difficult. I would say the most difficult part of film-making is dealing with people you are working with and trying to forget the drama that goes behind the scenes. IMAGE: Ileana and Ajay Devgn in Raid. Even though you have credible films on your resume, do you feel bad when an actor has to recommend you for a role, like Ajay Devgn did for Raid? What upsets me the most is when people spread rumours that are so malicious that affects not just me, but other people and their families too. I have tremendous respect for Ajay. We respect each other as actors. He is one of the most decent, nicest, people I have worked with. It is very rare to meet people like that. Trust me, I have been working for over 12 years, I should know. 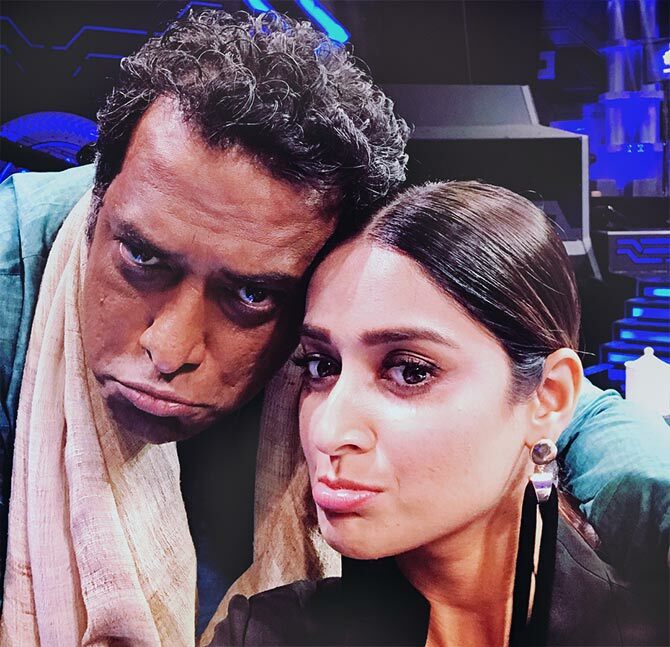 I have genuinely admired Ajay because he is really nice to work with. He has been nothing but respectful towards me. The only film he has recommended me was for Raid. He told me it was a great role, and that Raj Kumar Gupta was directing it. There have been other actors who have recommended scripts to me, it's not that only one actor has done that. At one point, it (rumours linking us) did bother me because I had a lot of admiration for Kajol even before I knew Ajay. She is probably the only actress in Bollywood with whom I have been so fascinated with. Even now, she is magic on screen. Do you ever discuss this? Not at all. We are friends, why talk about rubbish like this? I don't even speak to him over the phone. What I find very funny is that the person who misbehaved with me has never come out in the news. The ones who are decent get targeted. With the #MeToo campaign taking forefront, have you ever encountered it? Of course. That's why I have put it up on my Instagram. Would you like to speak about it? I don't know what to say. The reason I put that up was because I wanted to say that, yes, I have been associated with people who tried to harass me and tried to push themselves on me because they are powerful. I feel like a woman who has been recognised for being a positive and confident person, and yet, I have faced it. Situations like these are not easy to be in. You may think you can deal with it by retaliating, but sometimes, it is difficult. You have to deal with it carefully. After that Instagram post, quite a few nice male co-stars called me up and asked me what was going on, that they had no idea. For me, writing that post was like opening up, waking up. We live in a bubble and think nothing is happening, but these things happen to almost everyone. I had to deal with it too. Now, I am finally talking about it. As far as details go, it's very tricky to talk about it because you not just dealing with the person in question, you are dealing with that person's family, his image and a lot of other things. For that particular person to be found out, a lot of people need to come out into the open and say that they have dealt with it too. In the West, a lot of people have spoken up. Do you think women aren't taking names in India, as they may lose their careers? That is the general fear. But more than anything, you have to understand that India, to some extent, worships a lot of actors. When you have such a massive image built up about you, it's difficult to break that down. First, the families get affected. Then, the fans. They cannot imagine that person in a different light. It's very easy to point at a nobody rather than somebody who is very famous. More than the career, you need a lot of support. There are so many similar cases, but no one will step out and talk about it because no one will support them. IMAGE: Ileana in the Telugu film Devudu Chesina Manushulu. Do you miss anything about the South film industry? I was like the Akshay Kumar of the south. I used to do four films in a year. I was doing so much work, it was amazing. I really miss that. I did so many films because there were so many offers. But I was not really thinking it through. I wasn't this choosy. I was just young and wanted to do a lot of work. I wanted to do everything coming my way. Like, when I did Kick, I had so much fun making it. It was over-the-top and dramatic, there were a lot of fun songs, we got to travel so much. I miss the busy life. After coming to Bollywood, it has become slower. Here, we sit on the pre and post discussions -- the whole process of doing one film is so long! For example, while doing Barfi!, I finished two films down South. I don't think I will ever understand Bollywood. And I'm happy about that because it is a big, crazy, world. It's too complicated and chaotic to understand. You posted a mysterious post on Instagram about your marital status. You mentioned that the picture was clicked by your 'hubby'. Can you please clarify? I will never talk about my personal life. Social media is like a little window. Whenever I want, I can pull the blinds down.